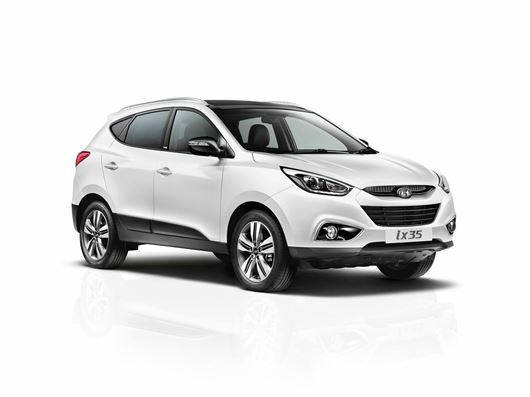 Hyundai has launched limited Go! editions on the i30 and ix35. The Go! models will be limited to 550 examples and feature £900 of extra kit as standard, while Go! SE will add £1450 of extra equipment, but be limited to just 150 cars. Hyundai has created the special models to celebrate its sponsorship of the upcoming FIFA World Cup in Brazil. The ix35 Go! will be available in two colours - Creamy White and Phantom Black - and be based on Premium Panorama trim, but feature £950 of extra equipment as standard, with 18-inch alloy wheels, panorama sunroof and privacy glass. The ix35 Go! SE bolsters the spec sheet by adding £1450 of free kit, with the addition of heated steering wheel, front parking sensors and tyre pressure monitoring system. Both ix35s are powered by a 1.7-litre diesel engine with two-wheel drive and six-speed manual gearbox. Just 550 units of the ix35 Go! will be made available, priced at £20,750 and 150 of the ix35 Go! SE will be available, priced at £23,000. The i30 Go! is powered by either a 1.6 petrol or 1.6 diesel with a six-speed manual gearbox, while the paint scheme will include Creamy White, Sleek Silver and Steel Grey. Like the ix35 Go!, the i30 benefits from a raft of extra kit, with alloy wheels, electric folding black gloss door mirrors, privacy glass and LED indicators. The i30 will also be available as Go! SE Panorama, which benefits from panoramic sunroof and 17-inch alloy wheels. Prices for the i30 Go! start at £17,300 and order books are now open.